For detailed instructions on how to make this project, please purchase Christi’s book “Polymer Clay & Mixed Media Together at Last” and look on pages 66-73 for full project “Winging It” details & instructions. In many ways, the features, shapes, forms, and details are very similar to that of making your own Dragon. As I encourage you each and every time that you start a project, you must begin with the end in mind. You need to have an idea of what you want to create, what you want your piece to feel like, look like, resemble, and most importantly you need to know what you are trying to portray with your artistic creation. This being said, I set out to create a bird that was fancy, a little hoity-toity, and had an almost “superior” look to her … I think I was able to accomplish that. Whatever color you have chosen as the primary color, use a lump about the size of a walnut (about 1/3 of a package) and roll a round ball. Make a similar body shape as for a dragon but with a shorter (and not so curly) tail. Separate the head section from the body & tail, and pull a gentle sloping beak. NOTE: Since my bird is hoity-toity, it’s beak is rather enlarged…on purpose too! Again using your main color, add freeform shaped wings and insert a bamboo skewer between them so your bird can hang freely when it is finished. Take a moment to nicely blend the seams on each wing using your finger or a blending tool. Insert a bead or gemstone for your bird’s eye. Now add curls, swirls, beads, and anything else your heart desires to decorate your bird! CREATIVE TIP: Embed some beads in key places to give your figurine some character. Add bumps for texture if you’d like. Add curls, feathers, dots, swirls, pearls, rice-like bits, a hairdo … whatever you’d like … but get creative! Take a walk on the wild side and do something you wouldn’t normally do, that’s the point of this tutorial after all. 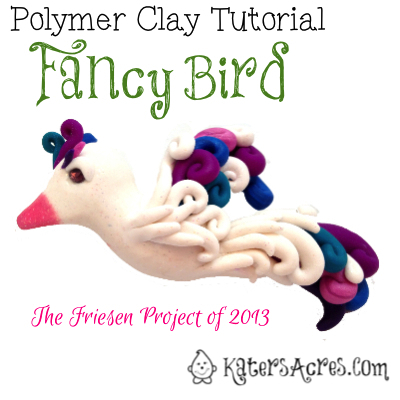 You can use the same color clay, different colors of clay, create a blend, however you’d like. NOTE: Don’t forget when embedding beads into clay, you must add clay over the bead to help hold it in place after baking. Add finishing details by using a mica powder to add pizzazz to the beak … don’t stick with orange, choose a color that will match the bird you created. Sign up for our free emails to get more sculpting tutorials weekly!